Background: The life-style-related diseases, like hypertension and obesity is a global tendency. To prevent these diseases, researchers� attention is increasingly focusing on pharmacological properties of some natural plants such as Undaria pinnatifida (wakame), the most widely eaten brown seaweed. Phytochemical studies of this seaweed exhibited the existence of many biologically active compounds, such as proteins, polysaccharide, fucoxanthin, macro and trace elements, as well as physiologically important fatty acids. Objective: This study reviews the main reports of the pharmacological properities of Undaria pinnatifida (wakame). Conclusion: The pharmacological active compounds of Undaria pinnatifida can be useful for the nutritional requirement of humans and may be beneficial in human health. The modern-day tendency to consume nutritionally rich diets coupled with irrational dietary habits are the main reasons of physiological disorders. These lead to the accumulation of visceral fat and finally result in obesity, diabetes mellitus, hypertension, dyslipidemia, inflammatory, tumor and other related diseases. Wakame (Undaria pinnatifida) (Fig. 1), a popular traditional foodstuff, can regulate physiological disorders1. 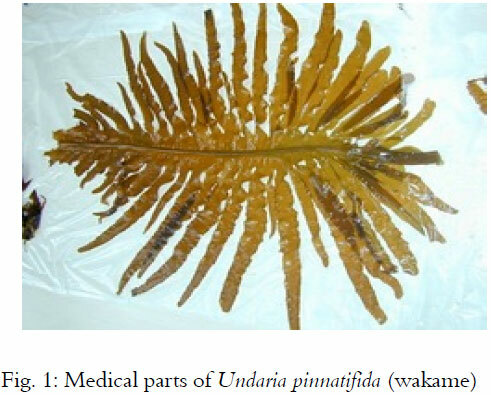 Undaria pinnatifida, usually known as wakame, is one species of brown seaweeds containing valuable pharmacological compounds such as large quantities of proteins2, polysaccharide3, fucoxanthin4 and to be rich in various kinds of macro and trace elements5. Therefore, wakame has several biological activities (Table 1): Prevention of hyperglycemia6, suppression of chemically induced mammary tumors7, inhibition of antihypertension8 and anti-obesity4. For these reasons, productions and applications of bioactive constituents of wakame (Undaria pinnatifida) as a kind of therapeutic food have been increasingly important topics of intensive researches. As a result of its health benefits and apparent absence of side-effects, the present review will focus on the pharmacological activities of Undaria pinnatifida. Angiotensin I-Converting Enzyme (ACE) inhibitory peptides play an important part in the renin-angiotensin system which can decrease blood pressure. These dipeptides were isolated from the extract of wakame, Undaria pinnatifida by several steps of chromatography and their amino acid sequences were Tyr-His, Lys-Trp, Lys-Tyr, Lys-Phe, Phe-Tyr, Val-Trp, Val-Phe, Ile-Tyr, Ile-Trp and Val-Tyr2. Minoru Sato et al.1,8. have made a long-term feeding experiment. Seven week old SHR were fed standard chow supplemented with protease S Amano-derived wakame hydrolysates for 10 weeks. In SHR fed the 1 and 0.1% wakame hydrolysates, elevation of systolic blood pressure was still significantly suppressed for 7 weeks1. The study suggests that Angiotensin I-Converting Enzyme (ACE) inhibitory peptides have an antihypertensive effect after a single oral administration in Spontaneously Hypertensive Rats (SHR). Sato et al.8 also found that these peptides have resistance against gastrointestinal proteases in vitro. Khan et al.9 have isolated Stearidonic Acid (SA), Eicosapentaenoic Acid (EPA) and Arachidonic Acid (AA) from the edible brown seaweed Undaria pinnatifida. Stearidonic Acid was active against mouse ear inflammation induced by phorbol myristate acetate edema, erythema and blood flow. EPA was also active against edema, erythema and blood flow. AA at low concentrations showed anti-inflammatory activities when measured 10 h later and AA doses of more than 243 μg per ear induced inflammatory symptoms 1 h later. Antioxidant activity: Antioxidants can delay or inhibit the oxidation of cellular oxidizable substrates and retard the progress of many chronic diseases. Sulfated polysaccharide (Fig. 2a) isolated from seaweed Undaia pinnitafida exhibited antioxidant activities. Hu et al.3 performed an in vitro investigation of sulfated polysaccharide fractions (S1 and S2). The experiment include superoxide, hydroxyl, DPPH radicals-scavenging effects and chelating ability. Hu et al.3 found Sulfated polysaccharide fractions (S1 and S2) isolated from seaweed Undaia pinnitafida have scavenging abilities on superoxide radicals, hydroxyl radicals, the 2,2-diphenyl-1-picrylhydrazyl (DPPH) free radicals and metal chelating. The result showed the two sulfated polysaccharide fractions (S1 and S2) possessed good antioxidant properties and had stronger antioxidant abilities than de-sulfated polysaccharides (DS-1 and DS-2). Kang et al.10 also discovered that Fucoidan Extracts (FE) can suppress CCl4 induced liver injury and found CCl4 treatment can increase the levels of GOT, GPT, ALP, LDH and MDA, as well as decrease levels of SOD, CAT and Gpx significantly. The pre-treatment of rats with FE, prevented the increment of levels of GOT, GPT, ALP, LDH and MDA, as well as recovered the levels of SOD, CAT and Gpx in CCl4 treated rats. In addition, FE can decrease the incidences of necrosis and cirrhosis in the liver tissue of rats. These results suggested that FE possessed antioxidant properties against CCl4 induced oxidative stress. Immune stimulating activity: In the present study, authors evaluated the innate immune stimulating activities of various polysaccharides using the silkworm muscle contraction assay system. To further establish the usefulness of this system for screening therapeutically effective materials, researchers examined the therapeutic effect of β-glucans from Gyrophora esculenta (GE-3) in a silkworm baculovirus infection model. These findings indicated that β-Glucan of Gyrophora esculenta (GE-3), fucoidan from sporophyll of Undaria pinnatifida, induced silkworm muscle contraction which reflects activation of the innate immune system11. Antitumor activity: Fucoidans from S. japonica and U. pinnatifida can prevent proliferation and colony formation in both breast cancer and melanoma cell lines in a dose-dependent manner which might be a potential approach for cancer treatment7. Virucidal activity: Previous reports showed the antiviral activity of complex sulfated polysaccharides which extracted from various species of marine algae and suggested that they interfered with the attachment of virions to host cells. Based on these findings, Harden et al.12 evaluated the antiviral activity of extracts from Undaria pinnatifida, Splachnidium rugosum, Gigartina atropurpurea and Plocamium cartilagineum against HSV-1 and HSV-2. Subsequent assays demonstrated these extracts are nontoxic and examined their promising role in the prevention of HSV infections of humans. In addition, Hayashi et al.13 have demonstrated that the production of neutralizing antibodies in the mice inoculated with HSV-1 was increased during the oral administration of the fucoidan for 3 weeks. These results indicated that oral administration of the fucoidan might directly inhibit the viral replication and stimulate the innate and adaptive immune defense functions. Anti-influenza activity: The Fucoidan (FuC) can inhibit the in vitro replication of Influenza A virus and stimulate both innate and adaptive immune defense functions in virus-infected mice. The present study suggested that oseltamivir can suppresse virus yields in mice more markedly than FuC but in immunocompromised mice, drug-resistant viruses always recovered after oseltamivir treatment while no resistant viruses were isolated from FuC-treated mice. Thus, FuC could be a new therapeutic options of anti-influenza14. Anticoagulating activity: The high molecular mass and viscous natures of fucoidans have prevented their applications especially as a therapeutic agent. However, the enzyme preparation degraded fucoidans into some low-molecular weight fuco-oligosaccharides (LMFOs) which have strong anticoagulating activities at which the Activated Partial Thrombo-plastin Time (APTT) and Thrombin Time (TT) were significantly prolonged. Moreover, LMFOs did not influence markedly the Prothrombin Time (PT). These results suggest that LMFOs could be an important drug for the anticoagulating activity15. Anticancer activity: Yang et al.16 suggested that intact fucoidans showed anticancer activity of 37.6%. Moreover, when hydrolyzed in boiling water with HCl for 5 min, the anticancer activity of fucoidans significantly increased to 75.9%. However, some fucoidans hydrolyzed in a microwave oven showed anticancer activity below 30% when treated more than 90 sec. The result suggests that anticancer activity of fucoidans could be markedly improved when they are depolymerized in mild condition. Anti-obesity activity: In recent studies, fucoxanthin (Fig. 2b), a characteristic carotenoid of brown algae, has been reported to have the anti-obesity effects in diet-induced obesity mice fed a high-fat diet (20% fat, wt/wt). The results showed that fucoxanthin significantly inhibited various lipogenic enzyme activities in epididymal adipose tissue and decreased the fatty acid b-oxidation activity. In addition, the supplement of fucoxanthin led to increase mRNA expression of uncoupling protein-1 (UCP-1) and UCP-3 in brown adipose tissue and that of UCP-2 in the epididymal white adipose tissue4. Beyond that, fucoxanthin has shown a great antioxidant activity, anti-cancer, anti-diabetic and anti-photoaging properties17. Anti-diabetic effects: Maeda et al.6 have made the study which examined the anti-obesity and anti-diabetic effects of fucoxanthin-rich Wakame Lipids (WLs) on High Fat (HF) diet-induced obesity in mice. The researchers found the HF diet resulted in hyperglycemia, hyperinsulinemia and hyperleptinemia in the mouse model. However, these perturbations could be normalized in the HF-WL diet-fed group. Furthermore, the HF-WL diet promoted mRNA expression of β3-adrenergic receptor (Adrb3) in WAT and glucose transporter 4 (GLUT4) mRNA in skeletal muscle tissues. These results indicated that the fucoxanthin-rich WLs are effective to prevent obesity and diabetes-related disorders. Yoo et al.18 investigated the anti-inflammatory effects and the underlying molecular mechanism of fucosterol (Fig. 2c) in lipopolysaccharide (LPS)-induced RAW 264.7 macrophages. Researchers also found fucosterol attenuated LPS-induced DNA binding and the transcriptional activity, the phosphorylation and nuclear translocation of nuclear factor-jB (NF-jB). Moreover, fucosterol could attenuate the phosphorylations of mitogen-activated protein kinase kinases 3/6 (MKK3/6) and mitogen-activated protein kinase-activated protein kinase 2 (MK2) which are both involved in the p38 MAPK pathway. These results suggest that the anti-inflammatory activity of fucosterol is associated with the inhibition of the NF-jB and p38 MAPK pathways. Phenols isolated from Undaria pinnatifida are an important group of natural products with antioxidant,antimicrobial,antiviral and other biological activities19. The present study reports the main and significant pharmacological properties of Undaria pinnatifida (wakame), like antihypertension, antiumors, antihypertension and anti-obesity, anti-inflammatory, pro-inflammatory, antioxidant, antitumor, antiviral, anti-influenza, anticoagulating, anticancer and antidiabetic. Likewise the mechanism of these pharmacological properties has been demonstrated. Finally, it is concluded that Undaria pinnatifida (wakame) is beneficial to the health of humans. Hayashi, T., K. Hayashi, K. Kanekiyo, K. Ohta and J.B. Lee et al., 2007. Promising Antiviral Glyco-Molecules from an Edible Alga. In: Combating the Threat of Pandemic Influenza: Drug Discovery Approaches, Paul, P.F. (Ed.). John Wiley and Sons Inc., New York, USA., pp: 116-132.